Although the state of the economy as ebbed and flowed over the past several years, people have continued to invest in remodeling at an increasing rate. The average amount spent for homeowner and rental improvement repair has climbed from $276 billion in 2011, to $284 billion in 2012, and to $317 billion in 2013 according to the Remodeling Futures Program at Harvard University’s Joint Center for Housing Studies. Based on the trend over the past three years, the amount spent on remodeling is estimated to continue to increase exponentially in 2014. The trend in spending can partially be attributed to a consistent number of bathroom and kitchen remodeling projects. The average cost of a bathroom renovation in 2013 was estimated to be $18,538 according to the National Kitchen and Bath Association. Are you one of many Americans who plans to renovate you bathroom this year? In order to get the biggest bang for your buck, you might want to consider including some of the top bathroom design trends for 2014 in your remodeling project! Color can be one of the simplest ways to modernize a room. Neutral pallets remain a popular trend in the design industry. Neutrals are clean, crisp, and really serve to open up a room and make it light, bright, and warm. Beige, bone, and gray are the top three neutral colors according to Building Design + Construction. To complement these colors, consider white fixtures and polished chrome or stainless steel sinks and faucets. If you prefer a bolder look as opposed to a softer one, go for daring black countertops with contrasting white accents. Black and white is a timeless color combination that continues to be a popular design trend for 2014. Updating your flooring and adding functional elements are two other areas that can instantly transform your bathroom. Marble flooring is always a great option for a bathroom. Book-matched marble flooring is one trend for 2014 that adds a unique, modern twist to typical marble flooring. Book-matching is a method that splits marble down the center to produce two indistinguishable grains in mirror image, creating an exciting element of symmetry and interest. When remodeling it’s just as important to consider function as it is aesthetic, particularly in a high traffic area like a bathroom. Building functional ledges into your shower for storing shampoo, conditioner, and other shower necessities is a great way to add practicality to your bathroom. 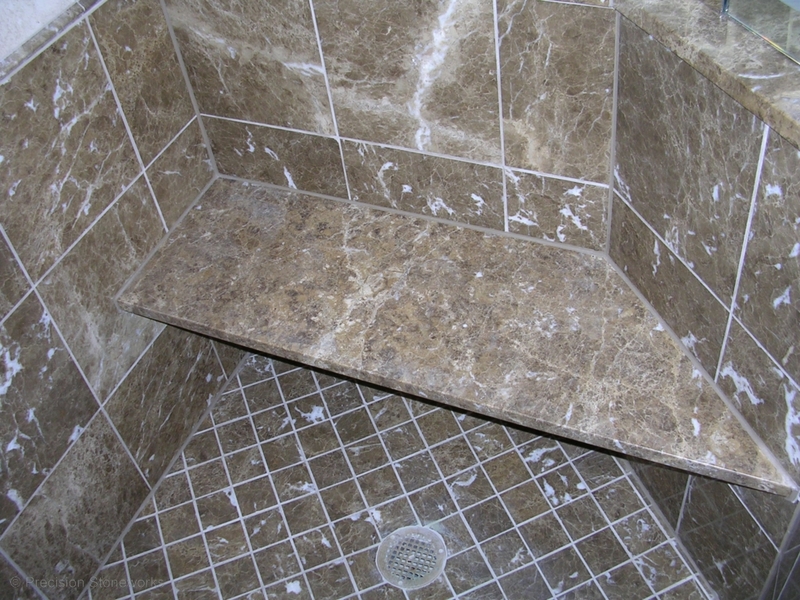 Better yet, shower ledges look fantastic when wrapped with natural stone! Having freestanding baths and vanities might just be the number one bathroom design trend for 2014. A freestanding soaking tub makes the perfect aesthetic centerpiece for a master bath. The idea is to create a spa experience right in your own bathroom, and a showpiece like a stand-alone bath cultivates an elegant, luxurious, and serene ambiance. Freestanding vanities are also very popular. With the right design, you don’t have to sacrifice storage and function with a stand-alone vanity as one might expect. If you’re planning to splurge on the ultimate spa-inspired getaway in your bathroom, consider adding a fireplace if the structural design of your home permits. Imagine how lavish and tranquil your bathroom would be with a crackling fire warming the room. It might just be the addition your bath needs to infuse a little more romance and relaxation into your life! Whether you’re looking for an updated tub or shower, a fresh sink, or striking new countertops, let Precision Stoneworks guide you through your bathroom renovation. We pride ourselves in our attention to detail and dedication to quality in every project. Our knowledgeable and skilled craftsmen would love to work with you on your remodeling project! To get started, contact Precision Stoneworks today!